19-Inch Arms! Part 1: Triceps! What we found turned our uphill battle into a successful mountain climb: a 19 1/4-inch arm measurement after a few key exercise tweaks... This part is going to cover the triceps. Read on for more. After you&apos;ve been training for awhile - we&apos;ve got 40 years between us - adding more and more mass can be an uphill battle, especially when you&apos;re drug free. But every once in a while you run across something that triggers a sudden burst of muscle size that sends your measurements into eye-popping territory. One thing we want to get across right up front is that no matter who you are, you can always learn new things. And sometimes what you learn, or relearn, can trigger immediate size increases. 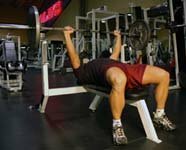 For example, we&apos;d been doing decline extensions - skull crushers on a decline bench - as our initial triceps exercise for a while, but our results had slowed. That indicated that we needed a change. We thought that to save time, and add mass, we&apos;d use dumbbells and switch to a compound movement, close-grip dumbbell bench presses. No need to load a bar, much more efficient. We just knew an immediate mass increase was only a few workouts away. 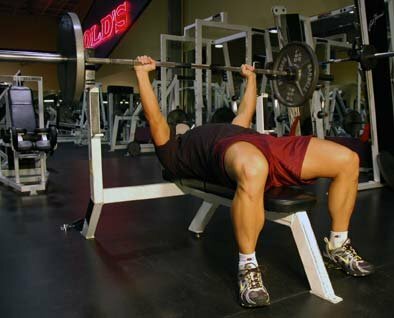 In our own e-book, The Ultimate Mass Workout, we classify close-grip bench presses as the Ultimate Exercise for triceps but - here&apos;s the key - on a decline! We were doing them flat (you should now picture our palms smacking our foreheads - D&apos;oh!). We were neglecting that critical Ultimate Exercise tweak. Then we recalled that on Jay Cutler&apos;s DVD, Ripped to Shreds, one of his favorite triceps moves is elbows-flared pushdowns, which is the cable version of close-grip decline - don&apos;t forget the decline! - bench presses. We decided to follow Jay&apos;s lead and adopt the elbows-flared pushdowns as our initial triceps move (no setup necessary). 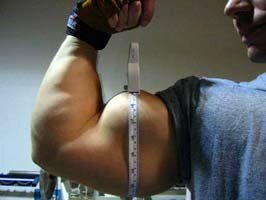 New triceps sweep immediately; shirt sleeves got tighter, with apparent mass increases after every workout. In fact, after only a few weeks Jonathan&apos;s arms taped 19 1/4 inches - bigger than they&apos;d ever been (and if you look at the photo, you can see that we missed the apex, or lowest dip, of his triceps, so they actually were even larger)! We did a set to exhaustion - around rep 10 reps - did some X-Rep partials near the top, semistretched position; immediately reduced the weight and then cranked out another set to exhaustion, with more X Reps or an X Spot static hold. We rested about three minutes and then did a second round, or we did a drop set of lying extensions instead of a second round of pushdowns. Jay Cutler Performing Elbows-Flared Pushdowns. On kickbacks we kept tension on the triceps throughout the set by lowering the dumbbells only about two-thirds of the way down on each rep, and we finished the set with a few straight-armed kickbacks, to force the lats into the action to fry the tri&apos;s.
Then we rushed over to two flat benches set up parallel to each other and did bench dips - but we used a partial X-Rep at the bottom, after each full rep, and ended the set with X Rep near the bottom. (By the way, that between-reps-partial technique is one Cutler uses a lot; see his DVD). We did these at one side of the cable crossover machine, turn sideways facing our nonworking arm to the weight stack and do pushdowns with the outer arm. Sometimes we used a palm-up grip, other times it was standard palm-down. When full reps were impossible, we fired out X Reps near the top, semistretched point, of the stroke. Click Here For A Printable Log Of Triceps Program. We did these using a rope attachment on a high cable - face away from the weight stack, lunge forward and do extensions behind your head, extending your arms on each rep till they are parallel with the ground (Can also be performed kneeling, without the lunge). Cable Pushouts (Shown In Kneeling Position). We did these with a dumbbell in each hand, simultaneously extending them. We did two sets, each ending with X Reps near the stretched position (close to the bottom of the stroke). Overhead Dumbbell Extensions (Shown With One Arm). Click Here For A Printable Log Of Triceps Program Variation. 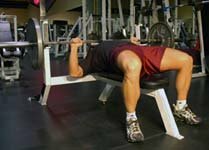 Why did we switch the last part of the routine, the more isolated exercises, at every other workout? So that one workout was arm-down contracted-position work (kickbacks, etc. ), and then at the next workout we got arm-up stretched-position work (overhead extensions, etc.). Both of those positions have special mass-building qualities, and by alternating between the two we kept the stress on the triceps fresh and trained the triceps full arc of flexion. Stretch-position overload has been linked to hyperplasia; one animal study achieved a 300 percent muscle-mass increase in 30 days! With either routine that&apos;s only about five sets, but aside from using a "decline" exercise at every workout and alternating between contracted-position and stretch-position exercises at every other workout, there are some other reasons this quick triceps mass blast is so effective. The end-of-set X-Rep partials at the semistretched spot on the stroke help activate an enormous number of fibers. That&apos;s verified by the size principle of fiber recruitment: In any set you activate the low-threshold motor units first, the mediums second and the high-threshold motor units last, during the most difficult reps.
Those high-threshold motor units are key because that&apos;s when you&apos;re blasting the fast-twitch fibers with the most growth potential. 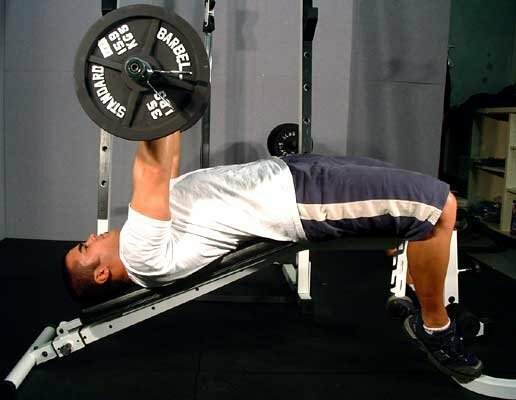 If you extend a set with X Reps, right at the max-force point on the stroke, you stimulate many more fibers. Our body is composed of many different groups of muscles and each person has a unique composition of muscle tissue in their body. Read on here to learn more about the 3 different muscle fibers and how they build differently depending on the type of sport. 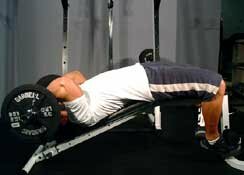 Drop sets help develop the endurance components of the 2A fast-twitch fibers (like the mitochondria and capillary beds), which can add considerable size to a muscle. Research indicates that the 2As are key for bodybuilders because they have both anaerobic and endurance capabilities. That means you can get a double-layered size effect in these fibers - if you use the right training to beef up both components. 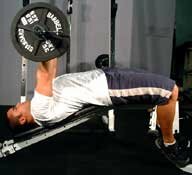 The right training includes tension times that are long enough, usually around 30 seconds per set (10-rep sets, with X Reps, and/or drop sets or supersets). Longer tension times maximize the size principle of fiber recruitment and force the fast-twitch 2As to develop both anaerobic and endurance characteristics, which results in a much bigger muscle cell. That&apos;s the reason low-rep sets are considered better for strength - they stress only one aspect of the 2As, the anaerobic component, leaving the endurance capability relatively untapped. So while the decline angle on the initial movement was the primary new-size-on-the-tri&apos;s catalyst, those other secondary details helped amplify the growth effect. As far as the decline goes, it&apos;s interesting to note that MRI studies show that decline extensions light up much more triceps mass than the flat version. Interesting! Magnetic resonance imaging (MRI) scanners rely on the principles of atomic nuclear-spin resonance. Using strong magnetic fields and radio waves, MRI collects and correlates deflections caused by atoms into images. MRIs (magnetic resonance imaging tests) offer relatively sharp pictures and allow physicians to see internal bodily structures with great detail. Using MRI technology, physicians are increasingly able to make diagnosis of serious pathology (e.g., tumors) earlier, and earlier diagnosis often translates to a more favorable outcome for the patient. We&apos;ll show you how we applied many of these same growth tactics to our biceps training in part 2 of this feature. Till then, pack some new size on your tri&apos;s with a quick-hit multi-angled attack - and don&apos;t forget the decline. Note: For more on X-Rep mass-building concepts, visit www.X-Rep.com.